With nutrition as one of the major tenets of lifestyle medicine, how can dietitians lead the lifestyle change movement? By 2020, the World Health Organization predicts that two-thirds of all diseases world-wide will be a result of lifestyle factors. This webinar hosted by Vicki Shanta Retelny, RDN, The Lifestyle Nutritionist, will focus on the science and recent strides in lifestyle medicine. With the medical community embracing nutrition education as a primary protocol in chronic disease prevention, it’s vital that dietitians be at the forefront with nutrition and culinary expertise as a primary part of a healthy lifestyle paradigm. Discuss the most recent research demonstrating the link between lifestyle therapeutic approaches and health. Employ specific strategies to counsel patients to prevent/treat lifestyle-related disease. Vicki Shanta Retelny, RDN, is a nationally-recognized lifestyle nutrition expert, culinary and media consultant. She is the author of two books, The Essential Guide to Healthy Healing Foods and Total Body Diet for Dummies®. her husband, two active youngsters and their precocious pet pug in Chicago, IL. Balance Your Plate with Nestlé is a program that helps Americans build convenient, delicious and nutritious meals that fit into a healthy eating pattern. By providing tips and tools, including recipes, the program shows individuals and families how to quickly assemble high-quality, balanced meals using frozen and refrigerated entrées paired with fruits, vegetables, whole grains, low-fat dairy and/or lean protein. With the right portions and nutritious side dishes, Balance Your Plate shows how you can eat healthfully and still enjoy the foods you love. 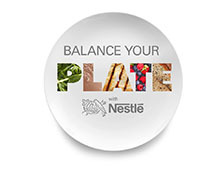 For more information, visit www.nestleusa.com/balance. Vicki Shanta Retelny, RDN, reports the following relevant disclosures: she is consultant dietitian for Northwestern Memorial Hospital and Health Maintenance Institute, as well as a media communications consultant for a variety of food brands, including American Pecan Council, Cherry Marketing Institute, Eat Smart Salads, Egg Nutrition Center, Illinois Farm Families, Wonderful Brands and Zespri Kiwifruit. She has certified that no conflict of interest exists for this program. View our disclosure policy.